Off On A Tangent: Dunkin' Donuts Mobile® App on Windows Phone? Dunkin' Donuts Mobile® App on Windows Phone? I'm reviewing the Microsoft Nokia Lumia 1520 Windows Phone. One thing it does not have is the Dunkin' Donuts Mobile® App. I like to use that app to pay for coffee in the morning with my regular phone, an iPhone. But I'm exclusively testing out the Nokia Lumia 1520 to see if can do everything I'm used to doing with my iPhone. Well, it can't run the Dunkin' Donuts Mobile® App, but there is a workaround. Bring up your payment screen on your iPhone or Android device, and take a screenshot. Then email that to your Windows Phone. Image: Payment page with QR code. Don't use this QR code. I saved it under favorites. Then when paying, have them scan the QR code on that image. I tested it today and it worked fine. 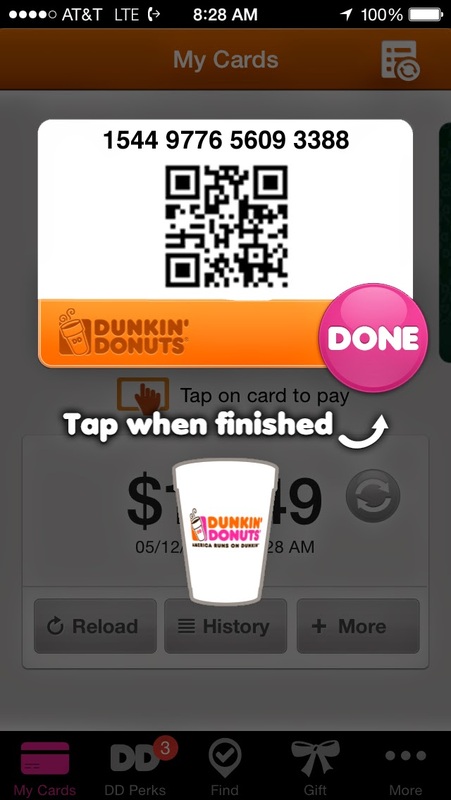 Note: It's also a good way to pay on iPhone or Android when the Dunkin' Donuts Mobile® App fails to open or load the card. Thanks @NokiaUS for the Nokia Lumia 1520 review unit. Buying a car. I just want someone to care.